I apologize for the crappy photo. I was in a hurry because, well- we're all hungry. The citrus roast chicken turned out excellent. No need for gravy, ketchup & other whatnots. wash the chicken and pat it dry with towels. rub salt & pepper all over including the crevices. 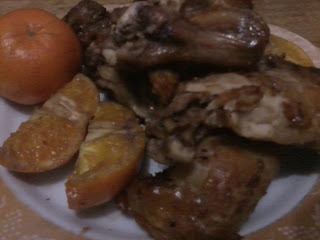 then squeeze the calamansi all over the chicken and gently massage it. yes- massage. not the shiatsu-type though. when you feel that the chicken is already relaxed and happy, slice the orange (in this recipe, i used kiat-kiat since that's available in the fridge) in quarters and stick it inside the chicken. pound the garlic a bit so let out the flavor and stick it in also. if you feel that there's still space, add more orange.